Pamela found cassettes from the answering machine she had as a teenager in the 90s. Despite the obvious risk of death by embarrassment, she’s sharing this archive of adolescence. Part confessional, part show-and-tell, it’s an exploration of awkward times revealed by the original message recordings of BFs, BFFs, a frenemy and wrong numbers. 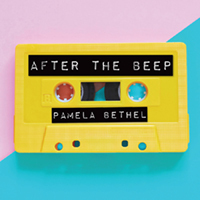 From childhood to adulthood Pamela Bethel takes the audience through her memories with the help of her trusty answering machine tapes. Using a projector the tapes are given closed captions so the audience can read along. The audience gets to listen an laugh as Pamela narrates the before and after of the tapes. Most of the tapes were funny but she did include some very racist and homophobic ones. This was done for a reason though. She said ‘hiding or pretending they didn’t exist i thought would be untruthful and worse’. She has a point but I still found the tapes incredibly hurtful. Pamela was very raw and emotional in telling her stories. She didn’t hold back anything and it made me trust her more. The play challenges us to face our past rather than hide or deny it. I think it’s a lesson many need to learn including myself. This is an interesting take on the story-telling genre and I really enjoyed myself.